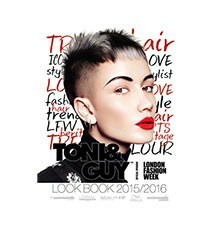 Each year, the TONI&GUY look book reflects the elements that are the foundation to TONI&GUYs success: hair, fashion, heritage and education. The latest creative collection, Socialized, is an interpretation of Global Creative Director Sacha Mascolo-Tarbucks creative vision, by the international artistic team and presented in 10 definitive advanced cut and colour techniques. The eight womens cuts and colours and two mens cuts are more dynamic than ever. Using label.m throughout the styles range from longer lengths with distressed textures, punctuated by overgrown eye skimming fringes to short graphic shapes featuring techniques like tight skin fades, strong angled disconnections and serrated graduations. Colour makes a statement with a palette of saturated retro red, electric violet, sunset purple and dramatic high contrast such as warm white juxtaposed with pewter to heighten or compliment each style. Each year, the TONI&GUY look book reflects the elements that are the foundation to TONI&GUYs success: hair, fashion, heritage and education. The latest creative collection, Socialized, is an interpretation of Global Creative Director Sacha Mascolo-Tarbucks creative vision, by the international artistic team and presented in 10 definitive advanced cut and colour techniques. The eight womens cuts and colours and two mens cuts are more dynamic than ever. Using label.m throughout the styles range from longer lengths with distressed textures, punctuated by overgrown eye skimming fringes to short graphic shapes featuring techniques like tight skin fades, strong angled disconnections and serrated graduations. Colour makes a statement with a palette of saturated retro red, electric violet, sunset purple and dramatic high contrast such as warm white juxtaposed with pewter to heighten or compliment each style.